My initial test of evaporative fan cooling for our Spec V went so well I decided to pursue a more permanent solution than the desk fan on the bar. It was working great, but had much to be desired for appearances. Since completing my DIY temperature controller (EDIT: I now use a prewired temperature controller), I have wanted to build in some small fans to help with cooling. 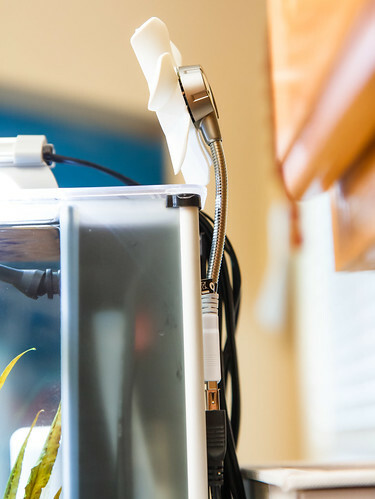 The best solution I could dream up would be some small (80mm or so) computer fans mounted to the top of the aquarium. This would involve cutting away a section of the acrylic top and somehow attaching the fans to the top, blowing downward (or possibly upward, drawing air through center opening of the top). I never really felt great about this option, mainly because it would be a permanent modification to the top and also because I didn’t think it would end up looking really bad. Computer fans just aren’t that attractive. I was also less than excited about figuring out how to work out wiring to one or more computer fans and source an appropriate AC to DC converter. A simpler solution would be to evolve from my desk fan experiment and use some sort of small, clip on fan. Most of these types of fans are large (6″ diameter or so blades), have cluncky protective cages, and would still be challenging to mount to the edge of the aquarium as the edge is obscured by the cover. I was recearching fan solutions on the web when I came across this video. So glad I did. 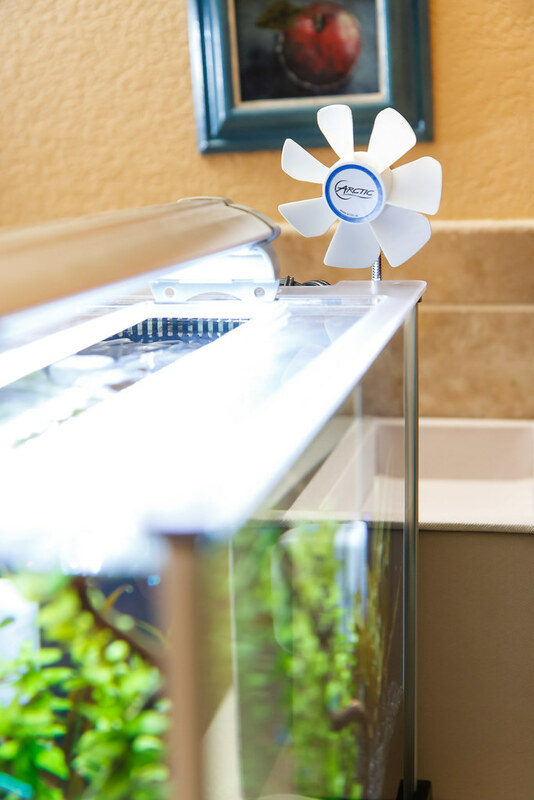 The video was informative as it relates to fan cooling for an aquarium and is a great success story. However, the real benefit was learning of the particular fan he used. The fan in his video is a small personal fan that people use for a variety of circumstances. I think most people plug it into the side USB port on their monitor to cool them off. I saw it in action on the video and thought it would work perfectly for our Spec Aquarium. The fan has a few unique features. It does not have a protective cage, which makes it smaller in total. It has a flexible shaft that allows for the fan to be positioned where you want. Lastly, it is not powered by batteries or a power brick, but is instead powered by a USB connector. It is small. I measure the fan diameter at 1-7/16″ (87 mm) and a total length from end of fan blade to end of USB connector of 8″ (203 mm). Overall, I think it is a fine looking fan. A great quality of this fan is that it runs quiet. There are times I can hear it, but the house has to be very, very quiet (no air conditioning or dishwasher running). I can’t imagine the noise being bothersome to anyone. 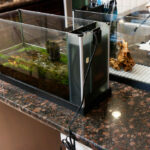 This installation is on our Fluval Spec V, but I’m sure it can be adapted to work on any number of aquariums. A Male to Female USB Extension Cord. Select a size that will extend from the side of your aquarium to your power source. The exact wording is ‘A’ male to ‘A’ female USB cord. They come in various lengths. 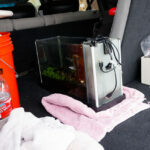 I used a 3 ft (91 cm) long cable that was plenty to reach from the aquarium into the end of my storage box. A USB charger. This is the same type of charger that you plug into the wall to charge a phone: plugs into an AC wall outlet and provides power to a USB device. I ended up buying one from RCA that has two USB outlets; I am set if I ever want to run two fans in the future. 3M dual sided foam tape. I bought the 1″ (25 mm) wide variety and cut the width down to size. The component setup is fairly simple. 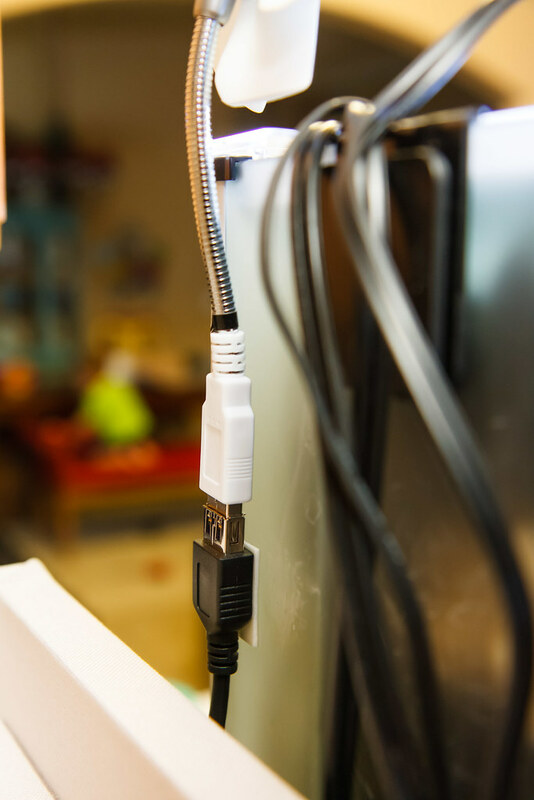 You start with the USB charger plugged into an electrical outlet (in my case, the cool outlet of the temperature controller). 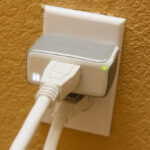 Into this you plug the USB extension cord. 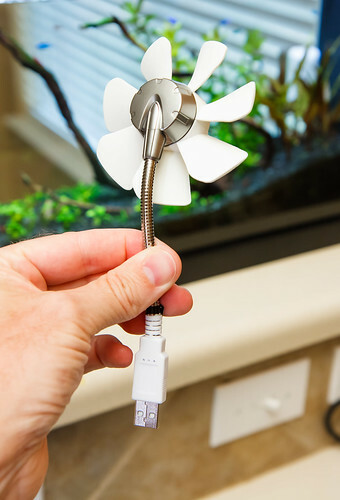 This leaves you with the female end of the extension cord to which you plug the USB connector on the Arctic Breeze fan. The only real DIY aspect of this installation is how to affix the fan to your aquarium. I first played around with where to locate the fan on our aquarium. For the Spec, it works nice to place off to one side (away from the cords exiting at the center). For our home, it looked nicer on the right closer to the kitchen. I put a few small squares of masking tape at the edges of the USB connector (bottom and side) to record the location. I then took the 3M double sided foam tape and cut a section that covered one of the flat, wide sections of the USB extension connector (that the fan plugs into). Then I pressed the tape and connector end into the located placement. With a little pressure, the tape sticks firm. Plug the fan into the USB connector and you are set. I’m really, really happy with how the finished project worked out. 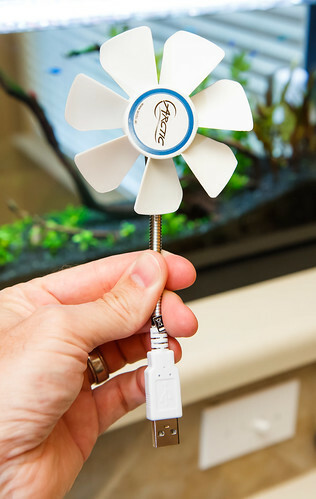 Appearance: This is purely subjective, but for an all-in-one nano aquarium, I think this fan is a fine solution. Yes, it is clearly visible, but it is small and is located on the end of tank where you already have alot going on with cords exiting. The fan’s contemporary look with its stainless finish flex shaft looks nice. It’s a whimsical looking fan; cute. 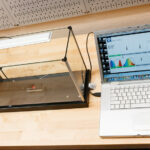 The scale works with this minuscule aquarium. I have three younger kiddo’s and I was a bit worried about them messing with a fan that had no protective cage. I explained to the two older ones not to mess with it. Before I mounted it I turned it on and let them jam their fingers into it when it was running (It doesn’t hurt – much). That satisfied their curiosity and no-one has touched it since. Function: As I have already touched on, it’s very quiet. No complaints on noise of any sort. The flex shaft works well to let me angle the fan down slightly to direct the air right at the opening of the Spec lid. Having the fan offset to one side helps to get the air around the light that is positioned over the opening. 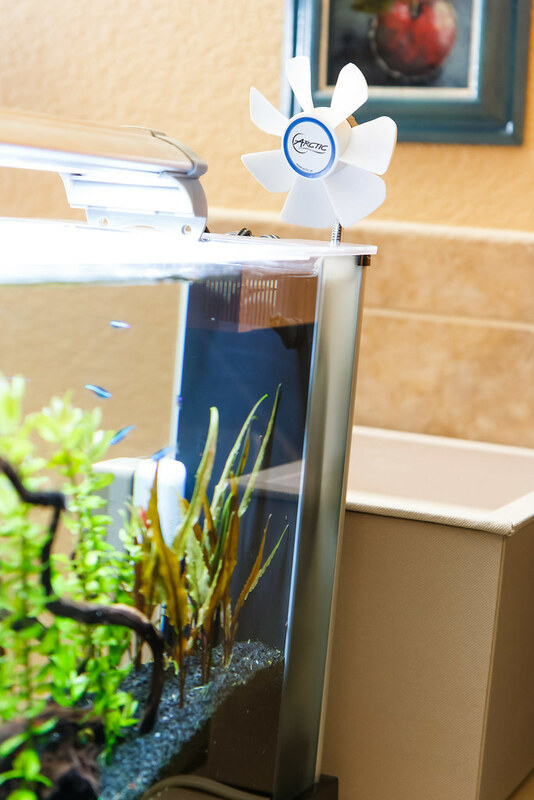 For a more traditional open-tank nano aquarium, it would be simple as you simply need to get airflow on any part of the water. The airflow from this smaller fan is considerably less than in my desktop fan experiment, so the rate of temperature drop is a bit slower, especially at the start. However, it still manages to lower the temp about 0.1 F every 10 minutes and lowered from 79.2ºF (26.2ºC) to 76.5ºF (24.7ºC) in 150 minutes. When paired with the temperature controller, the stability is amazing. I currently have the controller set at 24.6ºC. In observing over several weeks, The highest I have seen the temperature drift is to 25.4ºC. 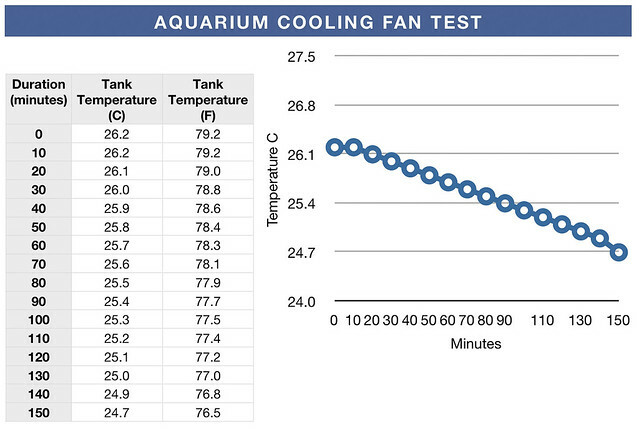 To have the temperature of this aquarium not varying by more than 0.8ºC is very nice. 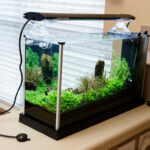 It creates a stable environment for the fish and shrimp; that stability helps to stave off stress and subsequent disease. I would guess that the fan runs 30-50% of the time during the day and much less than that at night. This little fan has no problem keeping up with the heat gain of our house and the internal gains from lights and pump. If I had a slightly larger aquarium, I would consider adding another Arctic Breeze fan on the other side (blowing in the same direction). This would be simple as many of the USB charging adaptors have multiple USB outlets. Just get another fan and USB extension cord and plug it in. By the way, the USB charging adaptor that I got has two USB outputs, with one labeled as a higher 2.1 amperage. I wondered if the fan would run faster with the higher amperage port. It does not; it runs the same speed when plugged into the 2.1 amp port vs the 1 amp port. This makes sense because the fan will only draw what it needs, which is apparently less than 1 amp. 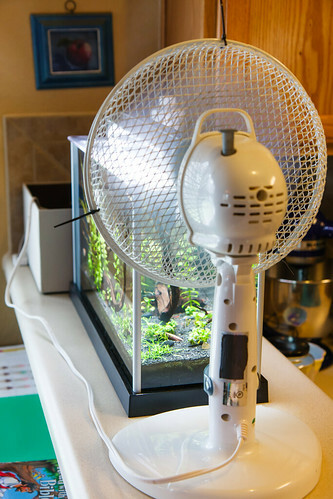 Evaporation: The only downside that I see to using a fan to cool an aquarium is a faster rate of evaporation from your tank. It is not that bad, but something that needs to be watched over. For myself, a low water level is alleviated during my weekly water change. I sometimes top off once mid week with a bit of dechlorinated water to keep the tank looking finished and nice. Cost: The total cost (minus shipping for the items) was: Fan = $8, Cord = $2, USB charger = $11, Tape = $3. Total cost = $24 USD. I love the pairing of this fan and a heater with my DIY temperature controller. However, I understand many people need to find a cooling solution and don’t have the resources to get a controller. If you are in this situation, I would suggest tinkering with the fan schedule and setup until you find a balance that can control your aquarium temperature. There shouldn’t be a need for the fan at all in winter (depending on where you live). In the summer, it might be the case where you can start the fan in the morning and then unplug at night. If the tank overcools, you could adjust the fan direction slightly away from the tank (aim a little higher or offset to the side). An option besides manually plugging in and unplugging would be to put the fan on a timer. 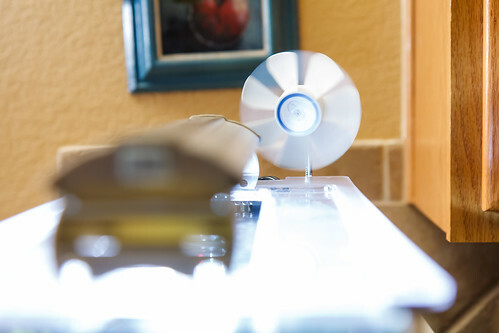 If you use a programmable model like ones from Leviton, you could have it turn on and off at various times during the day to keep it from overcooling. 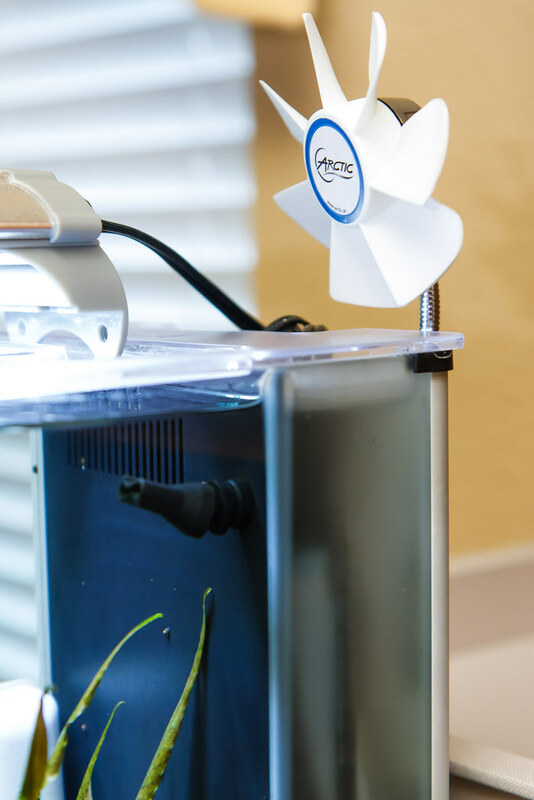 At any rate, if you are suffering from elevated tank temperatures, it is worth a shot to get this fan and get it going to help your critters out. This entry was posted in Spec Mods and tagged aquarium fan, arctic breeze usb fan, cooling. Bookmark the permalink. 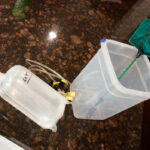 This is a great article and I plan to add this when I add the DIY temp controller. In the article you talked about the increased evaporation, have you ever looked into doing some sort of auto top off for the tank? For me, it’s not worth the time, effort, money, or most importantly, space to make an auto-top-off system for this small of a tank. It’s no big deal for me to dump a bit of water to top off. Even on vacation, we have a good week and a half before the water gets too low; probably closer to two weeks. What an excellent article very clearly written and great advice. Great article! I built the temperature controller last summer which turned out to be a success for monitoring the heater in the winter. I was looking for a while now for an affordable, DIY cooling system and I am so glad I stumbled upon this article. I plan to buy the materials and assemble the cooling system next week. For a 10 gallon tank, is there a slightly larger USB fan anyone can recommend me? I will probably buy the USB charger with two ports as well, so I can add a second fan if needed.